Site and foundation: The site was cut into a slope with a 35 ft diameter flat area. A 5 ft high cut was made at the rear, which leveled out towards the front. The dome has a 3 ft wide trench. The trench depth is sloped down hill for positive drainage. It was critical to have good drainage here in monsoon country. We used filter fabric to line the trench and filled the trench with 6" of compacted crushed gravel. We also dug a French drain behind the dome on the mountain. (Monsoon worthy) The first three rows are double-bagged gravel sets. The rear portion of foundation has an 8mil vapor barrier. Fill material: At first, we used the mountain soil (decomposed granite) and we had local sand delivered to the site. I was worried about the difference in the two. So we mixed the two through a metal screen and dampened our earth before adding it to the bags. After being on the island for a while I had a better mix delivered which consisted of 75% sand and 25% clay. After being tamped, this mix would literally form into a rock-hard wall. Scaffolding: Scaffolding was very important. We harvested 60 ft long bamboo poles and laid temporary plywood decking on top. People were more comfortable working at these heights with this scaffolding in place. Compression ring: This was one of the strongest elements in the dome. We spiked the last three rows with 18" #4 rebar. We formed a 2 ft wide by 6" concrete ring with two tracks of #4 rebar running through the center. We set up a bucket brigade, which was beautiful. We set ½" anchor bolts at 2 ft on center for the wooden oculus cap. Plastering: This was the final element for protecting the bags and securing the building. We used poly fish net as lath, with wire ties to connect it to the dome. I feel this is the cheapest and strongest method when using cement as a plaster coat. The exterior has one cement scratch coat and two coats of cement and exterior crème paint. Interior plaster: clay plaster upper walls / cement lower walls. Ventilation: The main entry wall was designed as a giant air scoop to increase air circulation. This feature funnels air from the windward mountainside into one of the gothic arched doorways. It's a hybrid air scoop with a physical wall and living arch. Part of the scoop is a 6 feet tall EB wall. There is a bamboo pergola in the shape of an arched shell over the entry. In the future passionflower will climb over and fill in his arched entry pergola. This will increase the much-needed airflow into the dome. Owen: First, tell us a little about yourself. What do you do for a living? Trevor: I work in Portland, Oregon at an architectural design firm (Endpoint Design). We specialize in remodels and custom homes. I also do consulting work for clients interested in alternative building systems. Owen: How did you get inspired about earthbag building? 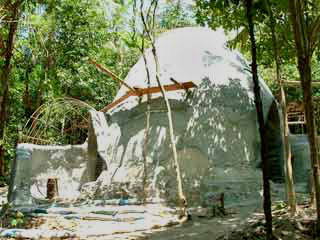 Trevor: My inspiration for earthbag (EB) building was on the beach in Thailand . I was pondering the creation of a sound temple and looking for local building materials. While on the beach I watched fishermen fill used woven poly bags with sand and stack them into a retaining wall. Epiphany! I remembered a research paper I did in college on earthen building and Nader Khalili. This was the first moment I involved myself in EB. Owen: Explain the basic concept behind the OMD. Owen: Did you use any innovative strategies? Trevor: One of our innovations was the EB apse. An apse is a semicircular recess with a domed roof. There are two small 6 ft diameter EB apse's (half domes) built into the OMD. One houses a digital music center while the other is an altar with the option of a water fountain. The other innovation we used in Thailand was the tunnel arch form for our doorway. Instead of a solid rectangle box form with an arch form on top, we framed two shear panels next to the bags with struts top and bottom. We still stacked a solid arch form on top. This type of form allowed us quick access to the center of the dome during construction and sped up the building process. Owen: What challenges did you face? Trevor: Four significant challenges were met on this project. 1. Access to the site was limited. A narrow path up a mountain with only half of it paved was our only gateway to the site. We used motor scooters to transport sacks of materials from the county road to the site. The cost of gas wasn't bad ~$25 USD to transport 65 cubic yards of gravel, sand, and cement, but this was a dangerous job. 2. Seven EB rows past the temporary floor decking we noticed the dome began to compress inward. This is the nature of domes inner forces. At the base of a dome the gravity force is down and outward, at the middle there is a neutral axis while at the top the force is down and inward creating a compression ring. We were concerned enough to stop construction and reevaluate what was happening and what might happen if we continued. The exterior EB rows were tilting upward revealing some of the outer barbed wire while the interior rows were bulging in and downward. We determined that the deformation was caused by corbelling inward too much at the floor decking EB row. This was effectively changing the pre-designed loads in the structure. If we continued, the dome may deform unpredictably but remain stable, or worse, fail. We decided to correct our mistake and remove the last seven rows and the barbed wire and set it aside and begin anew. This time we spiked every third bag below and above that area with #2 rebar. We measured every corbel twice and before long we were back in the swing of it. 3. While tamping on large walls you will notice the impact force transfer throughout the structure. This phenomenon can vibrate previously tamped bags out of position. Because of the increasing mass above the apse and the vibrations, warping occurred at one of the apse's opening. This could have been prevented if we had used solid forms while creating the apse and installed small internal buttresses on each side. We corrected this mistake by reinforcing the wall with rebar and buttressing the apse. 4. Last but not least the Gulf of Thailand had entered the dry season and a drought had slowed our progress. The owners constructed a new water system to supply the site, but not before we used dishwater to dampen our earth mix. Owen: Describe the cover over the top of the dome and how this effects ventilation. Trevor: The oculus (wooden roof atop the dome) is anchored to the compression ring. It is made from native hardwoods from the local mill. 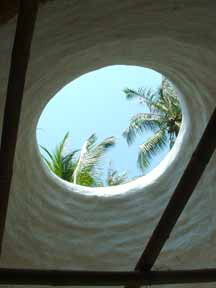 The roof was framed in a common Thai open scissor fashion with the rafters meeting at the center. The oculus has large eaves and is raised about 18" above the plate to let hot air out. Ventilation is pretty good in the dome with the open oculus and two large doorways. The dome had air holes around the upper walls (originally for the bamboo scaffolding) but these were later filled in because rain was seeping thru. The use of floor fans keeps a cool breeze on guests when the heat (~86 F or ~30 C in the shade) of the summer comes in mid-March to April. Owen: Did you use standard earthbag building techniques? Trevor: Yes, most of our technique was standard. We used the Earthbag Building book by Kaki Hunter and Doni Kiffmeyer as a required textbook for all the participants in the workshop. This along with a physical demonstration was a powerful teaching tool. Thank you Kaki and Doni. This book is by far the best manual on building with EB. Trevor: The previous year I saw Thai workers singing as they passed buckets of concrete to a building form some 50 yards away. I thought how wonderful to see such team-work. We didn't do much can tossing since coffee tins were scarce on this island. We used 2.5 gallon plastic buckets and did bucket brigade sing-alongs. Also, we stopped using bag stands and relied on 5 gallon plastic 'bucket chutes' (buckets with bottoms removed) for filling bags. The group just preferred shoots over stands. Another difference was using plywood sliders since there were no metal cookie sheets (sliders) on the island of Koh Phangan . Owen: In general, do you consider the project successful? Why? Trevor: Yes, I feel the project was a success. 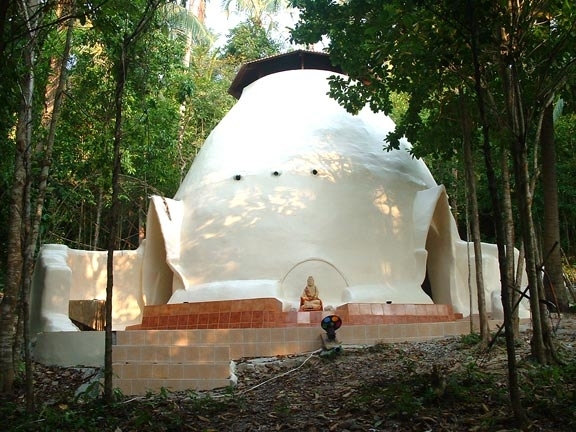 One, we created an enormous dome atop a remote island as a sanctuary - a 27 ft sound temple. The challenges were great and that is what made this experience so rewarding. I feel the workshop itself was intense and the members of the crew went above and beyond the call of duty. We had people who were so into building; we couldn't pull them off the wall, even for lunch. Another reason for success was having morning yoga classes and delicious meals. This was the key to having a healthy crew. Building is hazardous and one of my goals was to have no accidents. Creating a safe work site was accomplished by making people aware of dangerous situations, acknowledging personal limits and ability, providing rest periods as much as possible (though more would have been better). Also, having a good interpreter is so necessary. Thanks Narong. Trevor: Recent news of the OMD is new EB benches inside have been built. A plan to make OMD mosquito proof from 5:30 - 7:00 PM is in the works. Plus a future water feature is planned at the entrance. 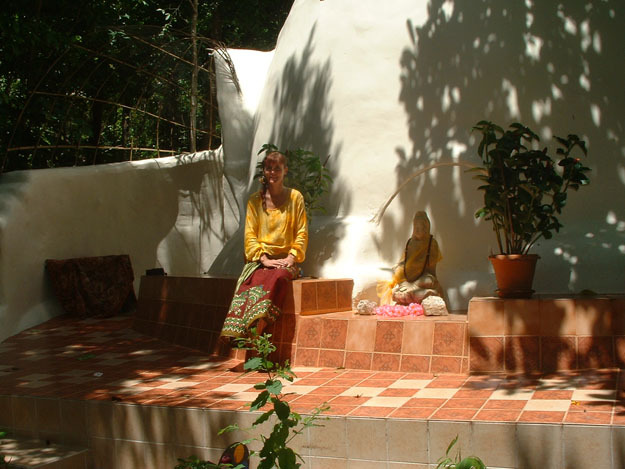 The OMD is used regularly by the Pyramid Yoga Center as a place for community gathering and healing. Owen: Are these structures best suited for urban or rural areas? Why? Trevor: I feel EB domes are best suited for rural natural environments where space is open and free. Since most city lots are small and set to a grid, rectilinear EB building makes more sense. You can maximize your footprint with right angles. In the city, building sites are based on existing building code setbacks, which are mostly rectangles. For either environment, EB will be more accepted by everyone if the design reflects the existing vernacular style of the area. Owen: Are domes built this way suitable for tropical climates/high rainfall? Trevor: Yes, unstabilized EB domes are practical and inexpensive. As long as the poly bags are protected during and after construction and the site has good drainage the structure fits this environment. Owen: What are the primary limitations? Trevor: In my experience corbelling has its limits with unstabilized bag building. Spiking bags allows for a larger corbel though. Tube EB (Super Adobe) construction seems to be where you could literally go out on a limb. And using stabilized bags or tubes seems to be limitless. Owen: Describe the community response. Trevor: The owners have had a very good response on the feel of the OM Dome. They have commented on the powerful acoustics of it, and the aesthetics of the design. Many guests to the PYC have spoken about a sense of peace within the dome. I have received emails from travelers who visited the dome and many compliments. The local Buddhist monastery came to the OMD and blessed it. I am still waiting on word from the locals to see if more Thais would like to build with EB. Owen: Any difficulties with building officials? Trevor: No building officials for this project. So that was wonderful. Owen: What would you do different next time? Trevor: Allow more time for building, or scale the project down to a smaller one. I felt rushed and exhausted because of time restraints (visa runs, airline tickets, others schedules, etc.). A very fulfilling experience though. Owen: Do you think most do-it-yourselfers could build an earthbag dome? Trevor: Yes, I think anyone with the drive and willingness to try a bombproof building style can do this. Owen: Any advice for owner-builders? Trevor: Having a realistic expectation, a good sense of management, and a functional design is key to the success of a project. Locate a good designer, consult with experienced builders and discover local material suppliers are a must. My wife has the best advice of all, start a building fund in a separate saving account and put in $32.00 a week. This will always keep a builder on top of surprise costs and mistakes. Owen: If homeowners could only afford three or four extra features, what would you recommend? Trevor: My desired features are doors/windows, lights, water and a heat source. But the most affordable is water. Plumbing in an EB structure is a cinch when you plan for it. Install short PVC pipes through a wall section at strategic locations. This provides plumbing or electrical conduit access for future additions. Owen: What can be done to sway millions of people towards building low-impact/low-cost homes such as these? Trevor: Visibility of EB to promote itself is key to swaying the people who don't know anything different. Building to the local vernacular style will create a connection between the new and existing neighborhood. Small modular designs that are easy and practical to build just make sense financially. Owen: What projects are you involved with now? Trevor: My latest project was the Portland Share Dome in Portland , Oregon . It's the first earthbag dome in Portland . It's 14 ft in diameter and cost $1,800 USD. Upcoming projects include a traditional Chinese clinic in Portland, Oregon and a Yoga dome in India . Visit www.archearth.com for more info. Scott Howard was the senior designer and builder on this project in 2004. This is the largest structure completed under Scott's leadership to date. This structure was completed during an 8-week workshop with over 20 participants. This catenary dome is over 23 ft x 23ft and one of the largest of its kind in the world. 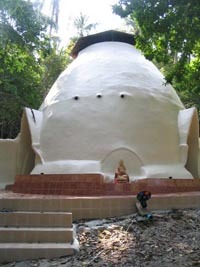 A crew of local Thai builders finished the dome with cement plaster and tile. The interior offers a rare acoustical experience because of its ability to focus echoes in the center of the space. The dome stands in tact on Koh Phangan, Thailand. 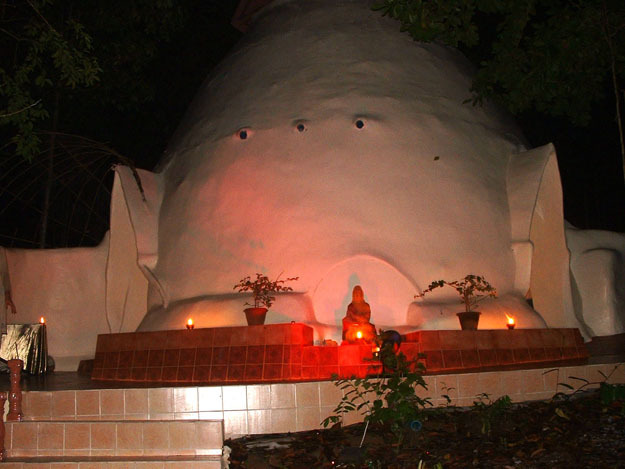 We call it the Sound Temple, while others call it the "om dome". Scott Howard can be contacted at scottATearthenhand.com. Trevor Lytle can be reached at trevorATarchearth.com.